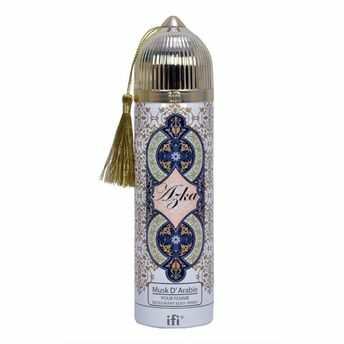 Azka presents, Musk De Arabie Body Spray which is a whole classic and timeless note in perfumery. Comfortable and velvety, this fragrance has a strong presence right from the start, it is dedicated to every woman and is perfect for every moment and occasion. This sensual scent immediately releases elegant floral notes, followed by a white musk trail distinguished by sweet and velvety floral-woody notes. A Classic and long-lasting fragrance for women. A sensual scent with Floral notes, White Musk and Woody Notes. Comfortable to wear and suits all occasion. Additional Information: Azka is a Premium Body Spray Brand from UAE known for its heavenly scented and long-lasting Perfumes and Body Sprays both for men and women. Keep yourself smelling fresh and great all day long with Azka Deodorants and Perfumes which are suitable for all occasions. Explore the entire range of Deodorants/Roll-Ons available on Nykaa. Shop more Azka products here.You can browse through the complete world of Azka Deodorants/Roll-Ons .